A boom in cheap package holidays in the 1960s is partly behind the "worrying rise" in skin cancers in pensioners, Cancer Research UK suggests. The charity says that although all ages are at risk, many older people would not have been aware of how to protect themselves four decades ago. Figures show that 5,700 over-65s are diagnosed with the condition each year, compared to just 600 in the mid-1970s. The condition can often be prevented by covering up and avoiding sunburn. Around 13,300 people are diagnosed with malignant melanoma - the most serious form of skin cancer - each year in the UK. And 2,100 lives are lost to the disease annually. Numbers are increasing across all age groups but the steepest rise is seen in over-65s. The charity said all ages are benefitting from public health messages explaining the dangers of holiday sun. Sue Deans, a 69-year old mother of three, was first diagnosed with skin cancer in 2000 and again in 2007. She said: "I was part of the generation when package holidays became affordable and you could go abroad nearly every year. "I don't think there was much understanding at the time about the impact that too much sun can have on your risk of getting skin cancer. "And I loved the sun but suffered quite a bit of sunburn over the years." She spotted signs of her cancer early on and has had successful surgery, but remains vigilant for anything that might need further checks. Professor Richard Marais of Cancer Research UK (CRUK), said: "It is worrying to see melanoma rates increasing at such a fast pace, and across all age groups. "It is important people keep an eye on their skin and seek medical opinion if they see any changes to their moles or even to normal areas of skin. "Melanoma is often detected on men's backs and women's legs but can appear on any part of the body." Research suggests that getting sunburnt just once every two years can increase the odds of developing malignant melanoma. Dr Julie Sharp, head of health information at CRUK, said: "You can burn at home just as easily as you can on holiday, so remember to spend time in the shade, wear a T-shirt and a hat to protect your skin and regularly apply sunscreen that is at least factor 15 and has four stars." Johnathon Major, from the British Association of Dermatologists, said: "The increasing incidence of skin cancer within the UK is alarming. "As people are living longer, more people are reaching an age where they are at a higher risk. 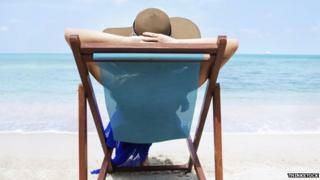 "Interest in package holidays and in fashion tanning are among the reasons that more people are developing skin cancer. "But it's crucial to remember that you don't have to go on holiday or use a sun bed to heighten your risk. Skin cancers can develop as a result of both short-term and long-term overexposure to the sun's rays within the UK."